Buildings claimed that owner miscalculated permissible number of dwelling units for proposed office conversion. 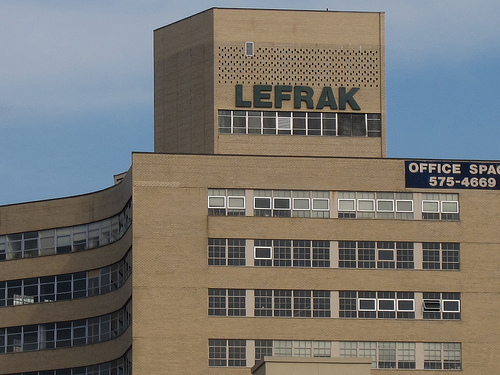 The Lefrak Organization in 2010 applied to Buildings for an alteration permit to convert its thirteen-story office tower at 97- 45 Queens Boulevard in Rego Park, Queens to a residential building. Lefrak built the 131,930 sq.ft. tower in 1960 pursuant to BSA approvals. Lefrak planned to convert the building’s top twelve floors to 108 apartments and leave the ground floor as commercial space. Because the building was constructed prior to 1961, Lefrak believed that the zoning resolution permitted the conversion of the building’s entire floor area, rather than limiting the conversion to the maximum residential floor area allowed by the site’s current C2-4 commercial zoning. Buildings agreed that Lefrak could convert the top twelve stories, but claimed that the number of apartments would violate the zoning resolution. According to Buildings, Lefrak was limited to 56 apartments. Buildings reached this number by determining the maximum residential floor area permitted by the underlying C2-4 district regulations on a lot equal to Lefrak’s site, and then dividing that number by the zoning resolution’s dwelling unit conversion factor for a C2-4 district. Lefrak calculated the maximum number of apartments by dividing the building’s actual floor area by the C2-4 conversion factor. Lefrak appealed the denial, claiming that Buildings had ignored the plain meaning of the zoning resolution. Further, Lefrak claimed Buildings’ interpretation would lead to absurd or unintended results, including an alternate conversion proposal that would result in a negative amount of permissible dwelling units. Buildings, among other things, argued that its method of calculating the permitted density of residential conversions would prevent a potential strain on City services created by the influx of residents stemming from Lefrak’s proposal. BSA agreed with Lefrak on the calculation formula and granted the appeal. BSA found that the cited sections of the zoning resolution were unambiguous and that it would be incongruous to permit an owner to convert an entire pre-1961 building that exceeded the underlying zoning district regulations, but then apply the underlying district’s floor area requirements when determining the maximum number of apartments the owner could provide. BSA: 97-45 Queens Boulevard, Queens (214-10-A) (March 15, 2011) (Carol E. Rosenthal, for Lefrak).